though it's not something of which i'm particularly proud, the current crop of first tier professional cyclists remain somewhat of a closed book; a mystery, if you like. i may liken that state of affairs to my current appreciation of the so-called 'hit parade'. it dawns on me that the very use of that latter phrase probably explains quite a lot. recollections of band members, albums, record labels and even producers, remain intact for the late sixties, seventies and the early portion of the 1980s, while i remain totally ignorant of any current trends in music, including that of my beloved jazz. oddly enough, that's not as odd as it might seem. i infrequently play with a beat group featuring a set list firmly rooted in the period described above, yet the regular audience of teenagers seems every bit as well-acquainted with the lyrics of 'sweet home alabama', 'all right now' and 'brown eyed girl' as anyone who lived through that era. and i'm currently transcribing drum parts for the local secondary school's forthcoming concert, presenting a fifteen minute selection of highlights from abba's 'mamma mia'. there's probably good reason for all this and i certainly have my own opinions, but it's something that makes me feel less self-conscious regarding my contemporary ignorance of the new kids on the start-line. though i'm not one for posters on the wall, were mrs washingmachinepost to allow such largesse, those would feature the likes of robert millar, greg lemond, bernard hinault, eddy merckx, miguel indurain and marco pantani. and pedro delgado. the spaniard, who rode for reynolds (twice), orbea-gin mg and pdm concorde during his twelve year career, won the 1988 tour de france, famously snatched victory from robert millar in the 1985 vuelta and stood upon the spanish podium's top step once again in 1989. yet he seems almost to be the forgotten tour victor; a one-off flukish winner of the tour, underlined, perhaps, by his notable lateness for the following year's prologue time-trial. despite the many theories as to why 'perico' was not on the starting ramp, delgado treats it in the matter-of-fact manner that pervades the whole of 'a life on the pedals'. "I didn't like the warming-up circuit that had been arranged for us [...] I look at my watch and I see that it's time. As I ride towards the Start I realise I have gone too far away." this state of affairs was predicated earlier the same day by a rather draconian police presence disallowing even the previous year's yellow jersey holder to ride on the circuit. 'a life on the pedals' was originally published in spanish, but one year after delgado's retiral from the professional peloton. this current edition, translated by tony fernandez and mousehold's adrian bell is an essential addition to the velocipedinal bookshelf. if i might briefly return to the musical meme, we are often advised that, to comprehend the skills and musicality of contemporary musicians, we ought best to examine who were their influencers. that seems every bit as applicable to the cycling world, even if only to understand the difference between tours and races of yesteryear, keen to place everything in some sort of valid perspective. but one thing that rarely seems to change, is a champion's respect not only for his team members, but that of his rivals. many of those individuals may themselves appear as the forgotten generation. in the service of their leaders, most of them subjugated any ambitions they may have harboured for their own careers. delgado offers many words of praise in one of the book's latter chapters, confirming the humility which appears to have pervaded his notable career. "Anastasio Greciano, Jesus Rodriguez Magro, Juan Martinez Oliver, Abelardo Rondón..., the best companions I ever met. They were the best professionals, always ready to give everything for a team mate, without concern for themselves." but for british readers, or more specifically, scottish, the 1985 vuelta may hold specific concern. led demonstrably by the 1984 tour de france king of the mountains winner, robert millar, right up until the final days, a puncture suffered by the scotsman allowed delgado and pepe recio a sufficient time gap at the finish to put the former into yellow. "The thought of winning the Vuelta never passsed through my head that day; I only dreamed of winning the stage in front of the people in my home town." common opinion revolves around the notion that the spanish had no intention of letting a scotsman with an earring win their national stage race, and it's possible there is more than a grain of truth in that contention. however, from the above quote it appears, in so far as pedro delgado was concerned, the likelihood of winning the vuelta was not on that day's agenda. mousehold press is to be congratulated on making this book available to an english-reading public. pedro delgado was one of the strategically important riders of the 1980s and 90s; a catalyst if you will. 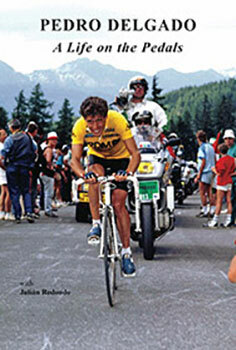 but for his unfortunately late start in 1989, he would most likely have acquired two tour de france yellow jerseys. the spaniard certainly lost more time in that prologue than the amount by which he trailed greg lemond in paris. having said that, had such been the case, we'd scarcely have had the dramatic finish for which that particular tour is famous. delgado seems perfectly at ease in his own skin; his writing style reflects an apparently laid-back personality, the latter seemingly only ruffled in the 1988 tour when he reputedly tested postive for probenicid. there's nothing in his account of that period that would suggest he was masking his taking of a masking agent. in fact, his narrative would suggest that he was as surprised and confused as those around him. as it transpired, the matter was cleared up almost as quickly as it had descended and delgado went on to take victory. whether matters would have taken the same course nowadays is a moot point; 1988 was not nowadays. 'a life on the pedals' is a fine, if unsensational, recounting of a professional career in cycling, slightly thematic in the later chapters, but an attractive read, nonetheless. julian redondo makes an excellent job of being a remarkably low-key interlocutor, prodding just enough, to have delgado tell the story in his own words and in his own time. cycling is often cited as possessing a rich heritage worthy of note: it is riders such as pedro delgado that add to its richness.